We recently traveled to Tehachapi where the southern Sierra Nevada tip meets the Mohave Desert. There we stayed in a home on a high windy peak with desert views and access to hiking trails. 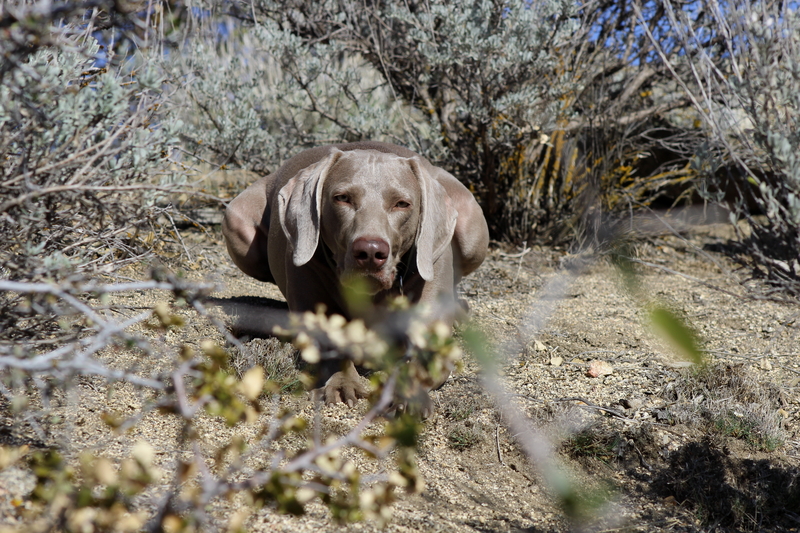 Our Weimaraner, Zso Zso, and I went out to explore. 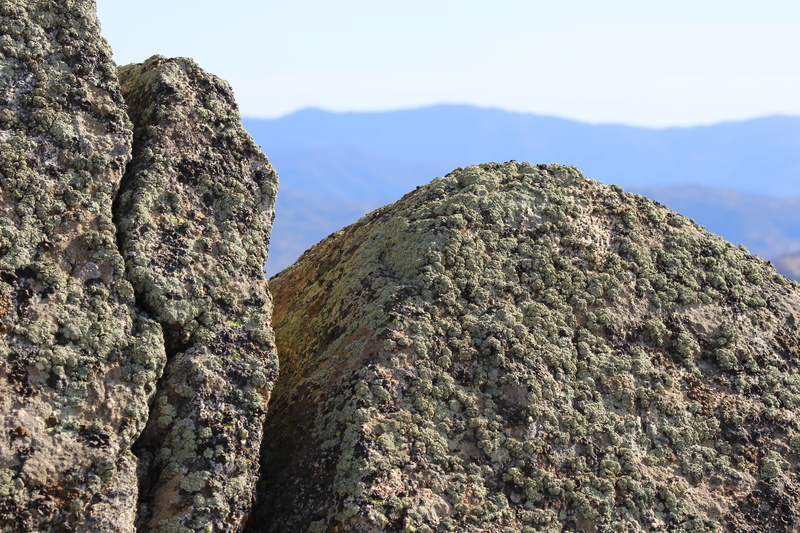 Granite boulders dotted sage-covered slopes, creating labyrinths of caves and dens that Zso Zso nuzzled. Later that day my husband and I met a woman eager to share her knowledge of the area. She warned of a particular Japanese restaurant and rattlesnakes. “Rattlesnakes?” Although I am watchful of them in the desert, I hadn’t associated rattlesnakes with this terrain. The following afternoon as a I set out on a hike with Zso Zso, voices drifted up from a couple of joggers beneath us on the trail. “There’s a lizard, ” a man said. “When the lizards are out, the snakes are out,” his companion sang in a single breath. As Zso Zso and I began our hike I admonished her to avoid anything that resembled a den, advice she disregarded. I let her run until the cinching in my stomach warned I might be tempting fate. Then I called her back. Kept her close to me. Pointed my lens at her. Captured her like a boulder ’round Tehachapi. Nice to know your sweet Zso Zso is/was safe. And you too – since it’s where God takes you! I understand that now there is a vaccine available for rattlesnake bites. I plan to use it for my dog this summer. Thank you, I will look into that. We’re hoping to do the Mojave Road later this year so preparing for an encounter will be paramount, particularly given how curious this little girl is! I knew someone whose kitten was bitten and killed by a baby rattlesnake while they were walking around Point Loma in San Diego. Those deadly creatures can be found in many unlikely places. Glad to hear that Zoe is fine. She’s so beautiful. I appreciate the heads up as we hope to travel more in southern Cal in the coming years. We have rattlesnakes in the northern Nevada desert but perhaps surprisingly have never come across one. Thanks, Julie, she is a beauty and a love. Oh I love it. You must have dogs, yes? We had a dog that got bit on the tongue by a rattlesnake when we lived in AZ. It wasn’t a good ending. I know one can’t protect them from everything, but stay cautious. Ohhhh. 😦 Yes, we will, thank you.